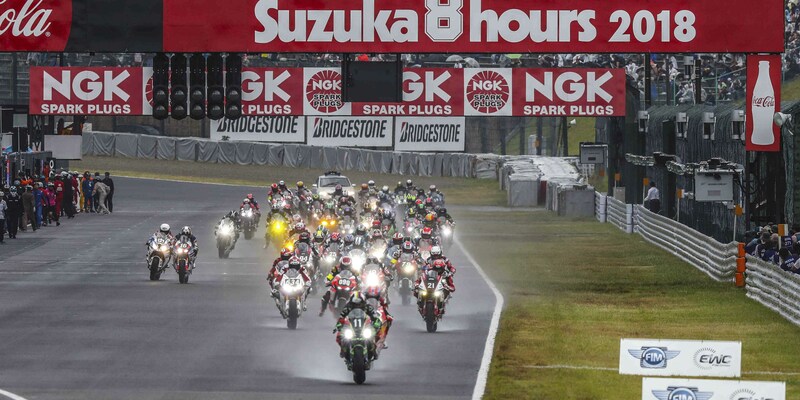 The 41st Suzuka 8 Hours kept viewers in suspense until after nightfall. Following duel after thrilling duel for the lead between Kawasaki Team Green and Yamaha Factory in the early stages of the race ahead of Red Bull Honda with Japan Post, in the end it was Yamaha Factory Racing Team that won the day. The factory Yamaha squad claimed victory with the same rider line-up as last year: Katsuyuki Nakasuga, Alex Lowes and Michael van der Mark. 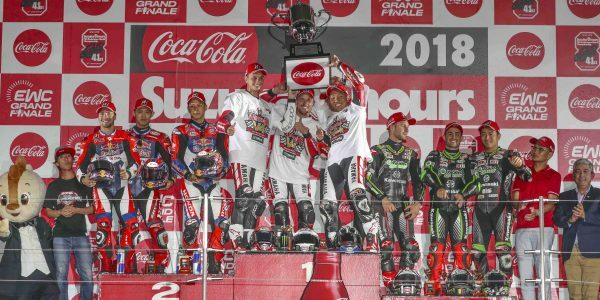 This is the fourth consecutive win for both Yamaha Factory Racing Team and Katsuyuki Nakasuga. The Japanese rider smashed the record so far held by Aaron Slight, the Suzuka 8 Hours winner from 1993 to 1995. Having led the race at the start on a soaked track, Red Bull Honda with Japan Post (Takumi Takahashi, Takaaki Nakagami and Patrick Jacobsen) finished 30 seconds behind the winner. Kawasaki Team Green, who were one lap behind, came in 3rd after being front and centre throughout the first half of the race. Kazuma Watanabe, Jonathan Rea and Leon Haslam waged a lengthy battle for the lead with Yamaha Factory Racing Team. However, a rain shower threw Kawasaki’s plans into disarray. Jonathan Rea crashed as he was entering the pits to switch from slick to wet tyres, causing the Kawasaki squad to lose precious time. Suzuki S-Pulse Dream Racing IAI (Hideyuki Ogata, Tom Bridewell and Kasuki Watanabe) ran a flawless race to finish at the foot of an all-Japanese podium featuring Yamaha, Honda and Kawasaki. A 5th-place finish made F.C.C. TSR Honda France (Freddy Foray, Alan Techer and Josh Hook) the first Japanese team in the championship’s history to win the FIM EWC title. Despite stepping up the pace towards the end of the race, GMT94 Yamaha’s David Checa, Niccolò Canepa and Mike Di Meglio finished 6th. 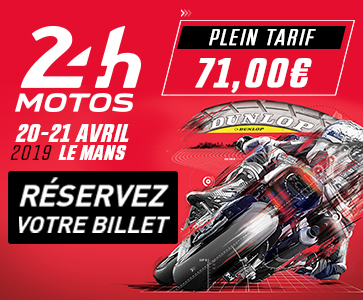 Christophe Guyot’s team are vice-champions of the 2017-2018 FIM EWC, 13 points behind the brand-new world champion. They were also awarded the Anthony Delhalle EWC Spirit Trophy for sheer perseverance in their quest for the world title. Another praiseworthy full-season FIM EWC team is British squad Honda Endurance Racing, who finished 9th just behind Honda Asia and KYB Moriwaki Motul Racing to become the 2017-2018 FIM EWC’s second runner-up. Suzuki Endurance Racing Team finished 12th behind two prominent Suzuki teams at Suzuka, who were however delayed by crashes: Yoshimura Suzuki Motul Racing and Team Kagayama. Mercury Racing also made it into the points thanks to a 14th-place finish, topping the ‘independent teams under contract’ rankings reserved for privateer squads racing the full FIM EWC season. Their win netted them €11,500 worth of prize money. Among the other teams eligible for the trophy, Mercury Racing came in ahead of NRT48, who suffered a setback at Suzuka in the form of a mechanical problem. Wocjik Racing Team, who were making their Suzuka debut, finished 25th to claim 2nd place in the Dunlop Independent Trophy. Bolliger Team Switzerland, who have far more experience of Suzuka, came in 30th after a stop-and-go for fitting wet tyres after the allotted time had elapsed when the race start was disrupted by rain. Motobox Kremer Racing got delayed by a crash and ended up non-classified. A crash also caused YART Yamaha to withdraw after starting from 8th place on the grid.